Water samples taken from the Ala Wai Canal and Harbor 12 days after a massive March sewage spill confirm the presence of a bacteria implicated in the death of a man who fell into the polluted harbor. But the estimated quantity of Vibrio vulnificus bacteria in samples taken April 10 "are pretty typical for these types of waters," where the bacteria is found normally, said Grieg Steward, a University of Hawaii assistant professor who released test analyses yesterday. » Vibrio vulnificus is a bacterium in the same family (vibrio) as those that cause cholera. It normally lives in warm, brackish water. It can cause disease in those who eat contaminated seafood or have an open wound that is exposed to sea water. Among healthy people, ingestion of V. vulnificus can cause vomiting, diarrhea and abdominal pain. In people with weakened immune systems, the bacteria can infect the bloodstream, causing a severe and life-threatening illness. » V. vulnificus is a rare cause of disease. Between 1988 and 1995, the Centers for Disease Control received reports of more than 300 V. vulnificus infections from the Gulf Coast states, where the majority of cases occur. Following Hurricane Katrina more cases were reported, of which at least five were fatal. In Hawaii the only known cases of death from V. vulnificus are Oliver Johnson on April 6 and a man with a skin condition who swam in a warm, saltwater pool on the Big Island in 2001. » People who have a compromised immune system should consult with their doctor, eat shellfish fully cooked and avoid exposure of open wounds to warm salt water. 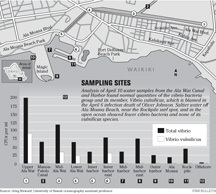 Steward and UH graduate student Olivia Nigro used two types of analysis to first determine the overall population of vibrio bacteria in water samples taken from the Ala Wai Canal and Harbor and nearby ocean waters. They then zeroed in on the vibrio bacterium they were most concerned about, because of its role in the April 6 death of Oliver Johnson: Vibrio vulnificus. Friends of Johnson, 34, said that he told them he was pushed or fell into the Ala Wai Harbor March 31, shortly after the city diverted 48 million gallons of raw sewage into the upstream Ala Wai Canal because of a force main failure. The vibrio family of bacteria includes more than a dozen species, of which four are known to cause disease in humans, Steward said. But only one of those, Vibrio vulnificus, is generally implicated in infections that start from wounds, he said. The other three, including the cause of cholera, usually enter the body via contaminated food. "We have a perception of the Ala Wai as a nasty hotbed for all sorts of things," Steward said. In fact, the estimated quantity of all vibrio bacteria (from 2 to 200 colony-forming units per milliliter of water sampled) and V. vulnificus in particular (up from 0 to 91 colony-forming units) is "pretty typical for other areas that have been investigated with similar temperatures and salinity," he said. A study of Chesapeake Bay showed V. vulnificus concentrations ranging from 30 to 210 colony-forming units per milliliter of water and one-tenth to 170 colony-forming units per milliliter in Charlotte Harbor, Fla., Steward's report said. 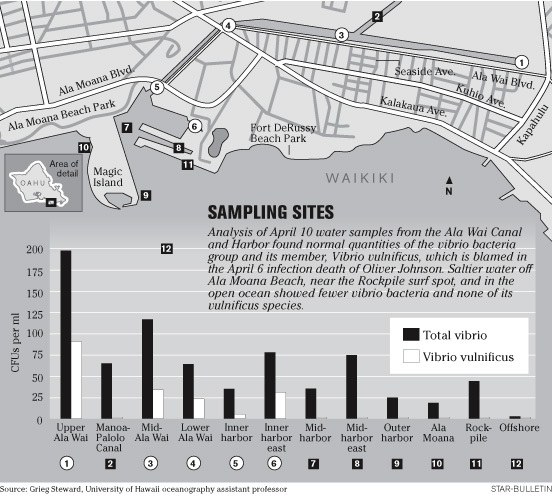 Steward also cited a 1998 study by Roger Fujioka of the UH Water Resources Research Center as showing a range of 1 to 184 colony-forming units of all vibrio species per milliliter of sample. One of the most striking discoveries was that the presence of V. vulnificus seemed to be related to how salty the water was. Areas where fresh and salt water mix had higher concentrations of the bacteria, while saltier areas had none, Steward said. Steward said he hopes to take additional samples over the coming year to get a clearer idea of normal vibrio levels for the Ala Wai Canal and Harbor. Larry Lau, the state Health Department's deputy director for environmental health, said yesterday that the department is "interested in learning more about pathogens in water" from the UH researchers, but is not sure yet "whether it actually means something to human health." Lau also said he was not sure whether the department would seek out any more testing on vibrio bacteria. He said the presence of the bacteria confirms the Health Department view of the Ala Wai "as something other than a swimming venue. That's been our view for many years."